Feel free to sign up for the newsletter that includes sneak peeks on upcoming novels and the inside scoop. You’ll see it all first. ***IMPORTANT INFO ABOUT THE PAPERBACK PREORDERS! Wow! I’m so excited and here she is. If you’re interested in upcoming giveaways including gift cards and signed copies please follow my page at https://www.facebook.com/JAOwenby/. Thank you all for your amazing support through this journey. The Truth She Knew will be available for pre-order soon. I haven’t actually written a post for a while, but I hope everyone has enjoyed the reblogs. If you follow my FaceBook page you know I’ve been busy running through edits with my editor and that the title of my novel changed from “Hidden Tears” to “The Truth She Knew”. My editor felt the new title encompassed the story on a much deeper level. We are currently working on the cover as well as the blurb and I should be finalizing those soon. 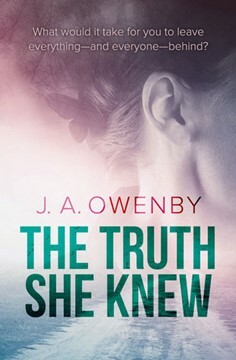 The other exciting news is that “The Truth She Knew” has changed from a stand alone novel to a series. I’m currently 30 pages deep into writing book two. I also sent the novel to my first beta reader and here is a little bit of what she had to say. I’ve learned so much from working with a professional editor and moving through the process of publishing. I’ve been surrounded by wonderful people that are supportive and excited. I don’t know what I’d do without them.